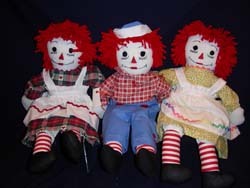 Mary Ciske of Dolls by Mary creates these wonderful classic Raggedy Ann and Andy dolls, as well as traditional styles and custom orders. 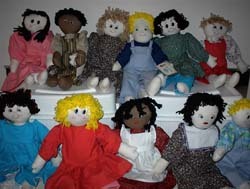 Her handcrafted dolls are available in two sizes – 15″ and 20″, and they are very reasonably priced at between $15 and $30. They’re available with different embroidered faces, skin and hair colors, and all of the dolls’ clothing is also handmade of crisp cotton fabric. My favorite thing is that they all have the traditional heart embroidered on their chests, just like the pair my mother made for me as a child.